PAL II Coils by Artery are made with a combination of wood pulp and cotton for a greater vape juice absorption and smoother hits. PAL II Coils come in two different resistance options, 1.2ohm and 0.6ohm. 1.2ohm coils are designed with great MTL vaping in mind and are work best with nic salts. 0.6ohm coils are mesh coils, allowing more wicking area, smoothing vaping, and making them great for 70VG vape juice that produce larger clouds. No matter which coil resistance you choose, the PAL II is sure to be your new best friend with its huge 3ml vape juice capacity and adjustable airflow options. How Long Do PAL II Coils Last? PAL II Coils last 1-2 weeks based on average usage and when primed before use. In collaboration with Tony B. One Become best friends with the Artery PAL 2, a new and improved version of the loved original PAL vape kit. Vape Expert Tony B lent his vaping expertise to this collaboration, and the result is a refillable vape kit built with experienced vapers in mind. The PAL II boasts a 1000mah battery capacity for a long-lasting charge, as well as an adjustable airflow option. The PAL II has two Coil options to choose from, 1.2ohm and 0.6ohm, both made with a combination of wood pulp and cotton for the great flavor absorption. The 1.2ohm coil is great for smooth MTL hits and works best with nic salt. The 0.6ohm coil is made with a mesh overlay and works best with a 70 VG vape juice. Each PAL II Replacement Pod can hold a huge 3ml of your favorite vape juice; to refill, simply remove the back cover, pull up the rubber plug, and fill through the slot. Remember to prime your coils before use to avoid burning and to extend the coil life. Designed with exceptional coils for the best possible flavor, a huge nic salt juice capacity, and a 1000mAh battery capacity, this vape is ready for just about anything you throw at it. The Artery PAL II was made with your safety in mind, including overcharge protection, overheat protection, short circuit protection, and a cut off after 8 seconds. 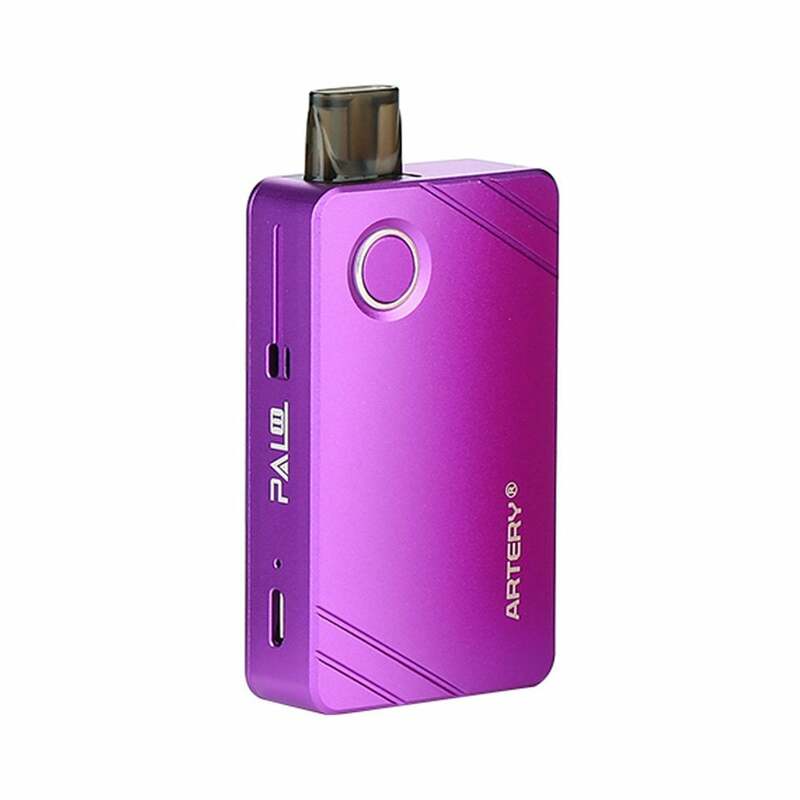 The PAL 2 AIO comes included with a 3ml pod and is available in Black, Gunmetal, Purple, and Red. How Long Do Artery PAL 2 Pods Last? PAL II Pods last 1-2 weeks based on normal usage when primed before use. Love this! I have been searching for something to take the place of my OPS-1 device which has been my favorite, but the pods don't last very long and are very hard to find. Tried several different devices and none were as good, until this one. Excellent taste and throat hit. Battery lasts a long time. I absolutely love this little pod system, it's great for me at work and so far no leaks. I just got to get a wrap for it. Just got this in and a mixed review. Nice form factor and great flavor... really surprising flavor. Unfortunately the back rocks and makes a clicking noise every time I pick up the device because the back doesn't sit flush. Really annoying. Oddly enough this only happens with a pod installed and is fine without a pod. I've tried 2 different pods with the same result. So yeah, a low review, but it is earned. Authentic & incredible! This little guy is the perfect AIO! I can easily switch between salts and regular juice on this and the flavor is unbelievable! Best pod system hands down! ET shipped FAST and accurate! Thanks so much! Love it! The 0.6 coil is amazing and long lasting. I wasn't a fan of the 1.2 coil. The battery life is great and it charges up incredibly fast, the 3ml pod lasts me 2 days before I need a refill. Out of all the pod devices I've tried, this is my favorite by far.